Welcome to another edition of Payout Perspective. This time we take a look at UFC 137 coming from the Mandalay Bay in Las Vegas, Nevada. 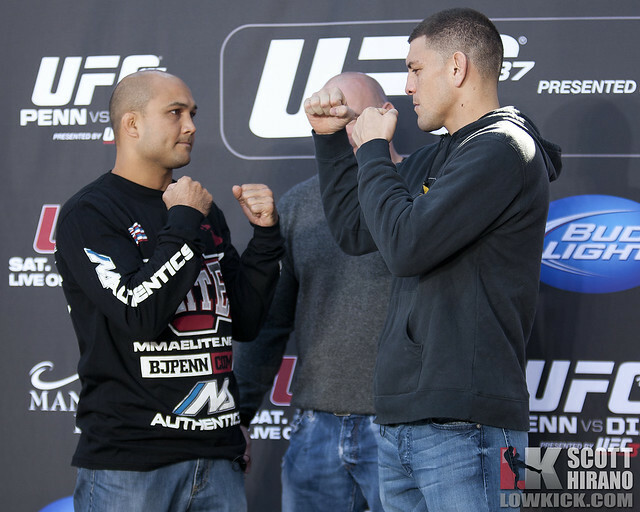 In the main event, Nick Diaz convincingly defeated BJ Penn affirming the need for a showdown with Georges St. Pierre. So now its obvious why Dana White kept Nick Diaz on the Zuffa roster despite no-showing press conference after press conference. Diaz showed his boxing skills as well as his jiu jitsu proficiency. For Penn, it sounded like he is eyeing retirement. At only 32, it seems like Penn could still make one last run at a title. But, if he were to end his career, he was one of the most dominant fighters in the UFC. While it appeared Penn acted like it was his last match in the UFC, he may just take some time off and reassess. At 32, he is still fairly young, but his dominant reign in the UFC is over. In the “co-main event,” Cheick Kongo defeated Matt Mitrione in a less than exciting match. For as much a personality Mitrione is, he could not handle Kongo. This fight was a main event in name only as a result of GSP’s injury. While it is written that this puts Kongo’s name in the heavyweight title picture, it seems like Kongo may need one or two more fights before he goes up against JDS or Cain. Nelson’s fat suit at the weigh-ins was pretty funny considering the fact that it initially looked like him. Still Nelson looked sharp. For Cro-Cop, it was his last fight in the UFC ring. He has been on the decline for a while at he gave a very nice post-match interview. MMA Junkie reports that the attendance of the event was 10,313 for $3.9 million. Cerrone and Palaszewski were featured on the Spike TV Prelims. * Griffin was scheduled to earn $34,000 for his fight against Palaszewski; Palaszewski was scheduled to make $10,000. Griffin missed weight, however, and was penalized 25 percent ($8,500) of his show money, which was added to Palaszewski’s show money total. Diaz’s salary likely would have been the same if he had fought GSP. Also, I’m wondering how much of a locker room bonus BJ Penn received for fighting Diaz instead of Carlos Condit. Its also interesting that Brandon Vera made $120,000 despite having his fight on Facebook (and almost breaking his arm). I am in favor of how the UFC penalizes those that don’t make weight. In the case of Tyson Griffin, who missed by 3 pounds, he forfeited his scheduled salary and that amount was given to Palaszewski. Also worked out for Palaszewski considering he picked up a KO bonus as well. Initially a Primetime series was going to follow GSP and Nick Diaz for their showdown. However, with Diaz being reassigned, the Primetime series was scrapped. The UFC Countdown show for 137 was only 30 minutes as opposed to the normal hour edition. Still, I thought it did a good job in telling the Nick Diaz backstory as well as including his hobby of triathlons. The re-revised promos for UFC 137 featured the infamous “Don’t be scared homie” quote. It’s weird to think that Bill Goldberg was the interviewer in the middle of Diaz and KJ Noons (the recipient of the Diaz trash talk). The UFC Octagon did not have any new sponsors with the exception of signage for UFC Undisputed 3 which was in the Octagon and had the checkpoint area. When it was announced that Nick Diaz would be facing BJ Penn, Metal Mullisha announced its sponsorship deal with Diaz. Diaz has worn the brand in Strikeforce. In addition, Diaz was to have a sponsor for his walkout music. The UFC announced that the BJ Penn-UFC branded Gym in Hawaii would be taking memberships about a week before 137. Jaco ran a deal for Brandon Vera fans with a special coupon code on Vera’s fight gear. Vera also was sponsored by Toyo Tires for his Facebook fight. Matt Mitrione sported new fight shirt company Traumma. Strikeforce heavyweight Daniel Cormier is also sponsored by the company as he wore the shirt on a recent episode of InsideMMA. Mitrione also wore a Chris Lytle for Senate shirt at weigh-ins. Its the first political shirt of campaign season. Donald Cerrone wore SafeAuto and Tapout stickers on his cowboy hat during his post-fight interview. Once again, a great use of the hat by the Cowboy. GSP-Diaz next. Carlos Condit, meet Anthony Pettis. Although, Dana White stated Condit “stepped aside” for GSP-Diaz. Condit’s manager, Malki Kawa, states otherwise. It would be disappointing if Condit does not get a shot through no fault of his own. But, let’s face it. He will have another fight before his “promised” title shot against the GSP-Diaz winner. If he loses, its almost certain he loses his shot as well. Certainly, GSP-Diaz is the match everyone wants to see. In fact, I think they made it before. -Pink gloves by the refs. I understand the intent and the cause, but do we really need it in the octagon. The NFL has jumped on the branding for Breast Cancer Awareness month, but it seems like its overdone. -Donald Cerrone. I believe “The Cowboy” is one of the best fighters coming out of the WEC merger. I like the personal branding. Wearing jeans, cowboy hat and cowboy boots at the weigh-ins distinguishing him from others. Plus, he’s a pretty good fighter. The Cowboy will be the co-main event on PPV for UFC 141. -Speaking of personal branding, Ramsey Nijem embracing a Chippendale’s gimmick at weigh-ins with bow-tie and no-shirt. Did we not learn anything from Dennis Hallman? -Brandon Vera arm was nearly broken by Eliot Marshall but he still won by unanimous decision. -I really liked Hatsui Haoki’s Dethrone “bird” shirt. FighterxFashion has the rest of the walkout shirts. -The UFC sent a press release of video of the Penn-Diaz weigh-in which it described as a “scuffle.” Not sure if its done this before or sent to hype the card due to concern about the drawing power. -Alex Rodriguez was in attendance. Does this help or hurt the UFC’s popularity? The top of this card was hurt first by Diaz’s no-shows, the card reshuffle and GSP’s injury. The UFC first touted UFC 137 as being Champion vs. Champion. Despite the removal of GSP from the main event, the UFC indicated that the show was a sell-out. After GSP’s injury, the card took a big star power hit despite BJ Penn in the main event. The co-main event featured mid-card level talent (Nelson, Mittrione, Kongo and Cro-Cop). Cro-Cop is past his prime while the other 3 are not top of the card caliber. It would be hard to foresee the buys for this card exceeding 350K. MMA Junkie reports Fox Sport’s Jay Glazer will host a new television show featuring UFC fighters on Fuel TV as part of the new UFC-Fox partnership. “UFC Champions Roundtable” is set to debut on Fuel TV on November 9th. Fuel TV will also have pre and post fight shows for the big UFC on Fox event on November 12th. There is some concern that Direct TV subscribers may not see the show’s debut as Direct TV and Fox are involved in contentious negotiations related to the renewal of Fox’s contract with the second biggest distributor in the US. Direct TV has approximately 19 million subscribers. Despite the tough rhetoric on both sides, SBJ’s John Ourand does not think the blackout of Fox channels to last long. Ourand spoke to SB Nation’s Luke Thomas on October 21st regarding the dispute. When they go public, everybody goes crazy like I’m doing right now with this story but for your listeners who really are worried about seeing MMA on FX and MMA on FOX broadcasts, it almost certainly, if you get FX and FOX broadcasts and you’re a DirecTV subscriber now, it might go dark for a week, maybe two weeks but these types of disputes always get resolved especially with companies as big as FOX because they don’t want to lose all of FOX programming. If Ourand is correct, Glazer’s debut on Direct TV is in jeopardy and so is the hype on the Fox channels for UFC on Fox November 12th. The Fox-Direct TV dispute may not hurt the UFC in the long run because its likely that the blackout will not be prolonged. However, it could hurt the UFC short term, and likely during the most important time in the company’s history. Certainly, this weekend’s UFC Primetime on Fox helps with the promotion but the Fox blackout will definitely hurt UFC’s promotion as well as its transition over to the Fox networks. MMA Junkie reports that Dana White is taking over the company’s negotiations for a new deal with Showitme. Lorenzo Fertitta was the lead in the negotiations prior to Ken Hershman leaving Showtime for HBO. This is an interesting development as most believed that Zuffa/Strikeforce-Showtime would mutually end its contractual relationship when the existing agreement ended. Perhaps Zuffa sees Showtime as a network it could keep Strikeforce Challengers or a “Challengers” type series if Strikeforce dissolves. Or, he wanted to meet the new team in charge of Showtime to gage a potential competitor in the MMA business. With UFC content heading to Fox, a contract with Showtime would mean Strikeforce will continue in 2012. But, with most of its top fighters rumored (or already in the organization) to be in the UFC, only Strikeforce Challengers may survive. ESPN’s Dan Rafael tweeted that the official PPV buys for September’s Mayweather-Ortiz fight at 1.25 million. The numbers were provided by co-promoters for the event, Golden Boy and Mayweather Promotions. Mayweather-Ortiz generated buys from 1.25 million homes with a value of $78,440,000 in pay-per-view revenue, according to statements released on Friday. Mayweather has now appeared in the three biggest non-heavyweight pay-per-view events in the sport’s history, including Mayweather vs. Oscar De La Hoya ($136,853,700), Mayweather vs. Ortiz ($78,440,000) and Mayweather vs. Sugar Shane Mosley ($78,330,000). Bad Left Hook notes that the PPV revenue may be skewed considering the PPV price was $10-$15 higher than the norm: $69.95 (HD) and $64.95 (non-HD). The strong buy rate and revenue shows that the event’s title, “Star Power,” was directed primarily to Floyd Mayweather. With Mayweather reaping the rewards of the event based on the unique payout from the fight, Mayweather likely cleared the estimated $40 million he would earn from the night. Based on these numbers, I would argue that this would make a fight with Manny Pacquiao harder to make. Further, Mayweather would be in no rush to broker a fight with Pacquaio as he’s sitting on a $40 million payday. Both sides would want to take more than a 50-50 split and the fact Mayweather can point to his drawing power is evidence that he should claim more than Pacquiao. Then, there’s the fact that he would risk the chance of losing his undefeated record. Pacquiao would counter that his worldwide likeability would claim an international audience. Despite the skepticism, hopefully the sides can agree to a split and the fight will happen sooner than later. MMAterial Facts (10/28/11) : UFC Japan PPV, UFC on FOX Prelims, and Will Strikeforce Live? Welcome to this edition of MMAterial Facts, where we feature articles from around the MMA community. MMA Junkie reports that episode 7 of TUF 14 scored an average of 1.6 million viewers. The ratings for this week received a household rating of 1.2. Wednesday’s two-fight episode scored an overall 1.2 household rating, as well as a 1.5 rating among men ages 18-49 and a 1.7 among men 18-34. It was the third-highest rated cable program in its timeslot in the latter demos. Television by Numbers reports that episode 7 received approximately 1,649,000 viewers and received a 1.0 household rating amongst viewers 18-49. MMA Payout had the opportunity to speak with the owners of CageHero, Mark Mastrandrea and Ian Parker as it recently re-branded itself focusing its business to target kids. Once a sponsor of fighters in the octagon, it has a new web site, a new clothing line and its CageHero Kids Team. MP: When did Cagehero decide to target kids? What was the basis of your decision? Did you do any market research or look at trends to target a younger demographic? CH: With the characters we have developed, we knew kids were always the ultimate destination. We felt the need to educate the decision maker first. The 18-34 Male demo is the target everyone looks too, but we knew the increase in women’s interest-both as participants, and consumers in MMA was important too. Both parents- the mother and father buy the kids their clothing. When we looked at the numbers, we also found that the Youth Apparel Market is actually bigger then the Men’s Apparel Market. MP: How did you find the kids to be in the commercial? CH: It started with Stevo- the mohawked wrestling YouTube sensation. When we saw his video on YouTube, it made both of us smile, laugh and really remember the days of Youth Sports. Days later we traveled to see him at a tournament to meet him, and his parents-the family were great people. We then thought of the concept of the Cagehero Kids Team- a compilation of the world’s best youth athletes across the world promoting there respective youth combat sports. We checked out some kids in Vegas, California and then received some help from our friends over at Youth1.com. In the past 2 days we have received almost 100 emails of new kids applying for the team. MP: Are you still sponsoring MMA fighters? If so, who. Are they mostly in Bellator? I see that Ben Askren was in the commercial. Is he still sponsored? CH: As far as the stereotypical MMA Marketing, walking out wearing our logo- Ben Askren is the only fighter in either Bellator/UFC that we will be marketing. Ben is a great guy who really embodies our brand. He also deals directly with kids, owning the Askren Brothers Wrestling Academy. We do some outside signings/appearances with UFC guys, but for the time being we only “sponsor” in Bellator. MP: How have/will the marketing efforts change as a result of the re-branding? CH: We will continue to market in MMA-Bellator for now. We have begun a stronger push with the Kids Marketing with Videos and a number of strategic partnerships with Youth-focused companies. We are also starting to focus more on a grassroots level with a presence at Youth Wrestling Tournaments and BJJ Competitions. MP: Are there any concerns that kids may be too young for MMA? CH: When we started this company, we knew we were investing in the sport of MMA. We’re passionate about it, and believe that one day it will be the largest sport in the world with acceptance by people of all cultures/ages. With the UFC on Fox Deal, the recent Bellator-Viacom deal and the constant penetration of new markets- we think it’s only a matter of time. Like Dana always says “Fighting is our DNA- we get it, we like it.” Our brand will always have MMA roots. It directly ties in with our characters as well. -In the 90s- the Mighty Morphin Power Rangers, with martial arts/Gymnastics. We are the new Superhero, with ties to Mixed Martial Arts- the new martial art. MP: How will you try to bring MMA mainstream? CH: We are trying to bring MMA Mainstream through the Kid’s Team, the characters and the message. Some people, even if educated, are ignorant to the sport. When you align it with Kids, Superheroes and a message like “The Hero Comes From Within”- it definitely puts the sport in a more innocent light. Our full length script and artwork with our finalized characters is also completed. We are currently taking it to market and attaching the proper people. MP: What are the future plans for the brand? CH: The future plans for the brand is to further develop the Cagehero Kid’s Team with athletes throughout the world. We are doing our first Youth Combine with Youth1, Ben Askren and some surprise UFC guests in the upcoming months. Keeping the same comic book aesthetic. As far as the Adults, we will continue to market in Bellator, and always keep our eyes open if the opportunity is right to go to the UFC. Our new adult line is more geared towards inspirational lifestyle apparel. The Big Picture remains the same: A comic book, a movie. Become this generations Superhero. CageHero is a unique brand and based on its designs, it was poised to make an easy transition from the young male target demographic to the kids demographic. This is partly due to the comic book designs and partly due to its positive messaging. Certainly, the way the brand is positioning itself in the market, it seems like the most kid-friendly, parent approved brand to wear as opposed to the more adult-themed shirts from other brands. The Strikeforce merger with UFC may have muted a portion of its fighters due to the UFC sponsor fee. Although it says that it may make a return, the brand has found another way to market itself within the MMA industry. Through outreach and visibility at youth wrestling and grappling tournaments and continutng its sponsorship of Ben Askren, it is making all the right moves in targeting youth with its new campaign. CageHero also is participating in a campaign benefiting Clothes4Soul, an organization that facilitates the donations of new clothing to those in need. When you buy one shirt, it will donate one to the organization. Participating in this program helps the CageHero brand in showing that it truly is making a positive impression in the MMA community. Late last night, Sergio Non of USA Today broke that news that media conglomerate giant Viacom had purchased a majority stake in Bellator Fighting Championships. Viacom, parent of MTV Networks, bought a majority stake in Bellator Fighting Championships and will start airing the promotion’s bouts on Spike in 2013, the companies told USA TODAY this week. They’ve had ongoing talks for about a year as they finished up various deals, and over the past month finally reached the point where they could announce the news, Bellator CEO Bjorn Rebney said. Selling to Viacom’s entertainment conglomerate guarantees a stable future for Bellator, said Rebney, who will remain in charge of Bellator. “It puts all of those cornerstones of ownership in place for us,” he said. “Which is something that’s been so seriously lacking in the MMA space with so many different companies, including Strikeforce and the IFL and Affliction and all the different failures that have occurred. Viacom has purchased a majority stake in Bellator Fighting Championships, USA Today reported Wednesday morning. The promotion’s fights will begin airing on Spike in 2013. The buy, said Bellator CEO Bjorn Rebney, provides a foundation for the promotion’s future. “It puts all of those cornerstones of ownership in place for us”, Rebney told USA Today. He will stay onboard to head the fight promotion. Spike carries rights to air the UFC library through 2012. For the time being, Spike will supplement MTV2’s current Bellator programming with highlight shows and related content, online and on TV. Additionally, Spike.com will continue to stream preliminary card fights. Bellator currently fields such talent as Lightweight Champion Eddie Alvarez, Middleweight Champion Hector Lombard, Welterweight Champion Ben Askren, Jay Hieron and Alexis Vila. – Bellator is now the #2 promotion in Mixed Martial Arts behind the UFC. – Although Spike’s agreement ends this year with the UFC, they stil lhave rights to the UFC library in 2012, which will prevent Bellator from airing on Spike TV until 2013. – Spike TV started talking about possibly investing in Bellator with MTV2 and Viacom’s mergers and acquisition group when TV negotiations fell through with the UFC. – Having a strong #2 promotion may be a good thing for the UFC, as they have been dealing with an FTC investigation for the majority of the year. – Bjorn Rebney: Viacom is the majority shareholder of BellatorMMA now… Rebney will stay on as CEO. – Bjorn Rebney: BellatorMMA will keep their tournament format through 2012 and 2013 on Spike. – Spike will supplement MTV2′s current Bellator programming with highlight shows and related content, online and on TV. Additionally, Spike.com will continue to stream preliminary fights. MMA Junkie reports that Bellator 55’s ratings this past Saturday night received an average of 168,000 viewers on Saturday night. The numbers show a decrease from Bellator 54 which posted an 185,000 viewer average. An immediate replay of the broadcast received a lowly 45,000 viewer average. Once again, the latest ratings continue the organization’s wildly inconsistent season-five numbers; two events have scored at least 235,000 viewers, and three have drawn 158,000 or fewer. Bellator 55 did go unopposed by the UFC and Strikeforce. Despite not going up against another MMA card, it seems that Bellator fell victim to College Football (which included several top teams playing at the same time as the broadcast), the World Series and HBO Boxing (including the first episode of Pacquiao-Marquez 24/7). The 168,000 viewer average is decent but one would think that it could have maintained, if not exceeded Bellator 54’s 185,000 average. Also, the replay numbers seemed unusually low. The MMAPayout.com Pay-Per-View, Television, and Live Gate & Attendance sections of the Blue Book have been updated to include all events in 2011. Reminder: you always access the information via the tab on the menu bar of every page. The sponsorship portion of the Payout Blue Book will be the next big project we will tackle. If anyone has any preferences, feedback, or ideas, please let us know. We will keep you updated on the progress of the project and will inform you when that goes live.